As we celebrate the birth of the Christ child this evening, we are also eagerly awaiting the birth of another sweet babe. Hoping that your Christmas is filled with laughter, wonder, and worship. That is so cute, Merry Christmas! o, i love you guys. Merry Christmas, dear friends!! That picture speaks wonder and sweetness and gentleness to me. It’s perfect for Christmas. Praying for you as you approach your own advent. So happy for you guys! The picture is so heart-warming. I love how Eva seems to know just the right thing to say! Merry Christmas! We can’t wait either! I’ve got yarn, a new pattern and free time….hopefully it will be ready by the end of January!! So happy for you Rachel! I have been hoping and praying for a new little one for your family. Can’t wait to hear about the arrival. 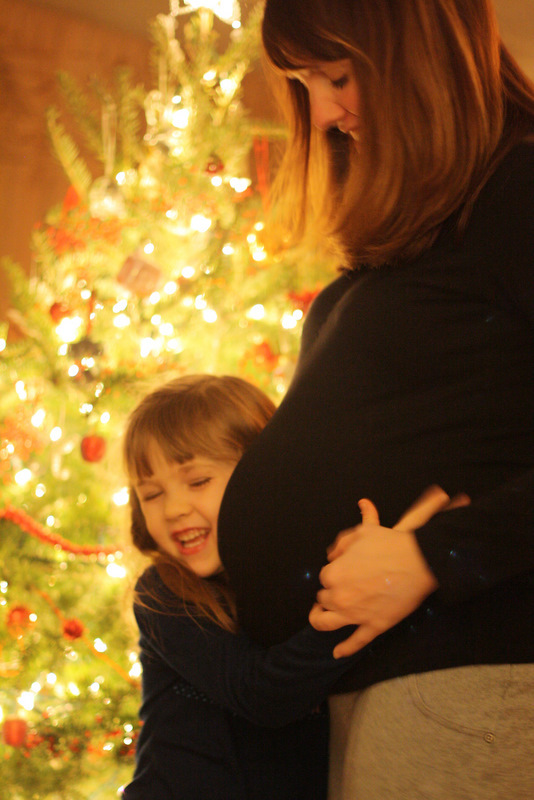 I am sure Ava will be a GREAT big sister! !